Welcome Back! I have a fun polish to show you today. This is Happy Unbirthday from Pop Culture Cosmetics. I won this and two other polishes on one of their Facebook Giveaways. Be sure to follow their FB Page for more offers and giveaways. Happy Unbirthday has a black jelly base with various sizes and colors of dot glitter. I love the color combination of this - so bright and fun! I stored Happy Unbirthday upside-down before I painted my nails so the glitter was easy to reach. This is one coat and I did a little "fishing" for some of the big dots. I'm sure if I would have applied two coats, I would have had more of a chance of getting some of the bigger pieces and there would have been quite a few more dots on my nails. I do like this sparse look though. Glitters like this are fun because you never know what you are going to get - each manicure is unique. Happy Unbirthday is available on the Pop Culture Cosmetics Etsy Site for $8.50. Be sure to check out the rest of her fun polishes too! I hope you are having a great week. Talk to you soon. Thank you! Yes, it's so fun, isn't it? Oooh, love the circle glitter in this one! :) It sure does! Check them out. Talk to you soon. Me too! I wanted to capture it better, but somehow I couldn't get a good picture. Russian Navy is gorgeous! What a lovely Emily person to give you RN :) It's a great color and it looks fantastic under this glitter! I'm kind of loving the circles, too, I see what everyone's making a big deal over. They look pretty darned cool. Yes, that Emily Person is lovely ;) Dots ARE pretty darned cool if you ask me! :) They are fun. Thanks for commenting. I know, I love that about this look:) Thanks for stopping by. I love how you layered this over a blue!! Just gorgeous Essie! 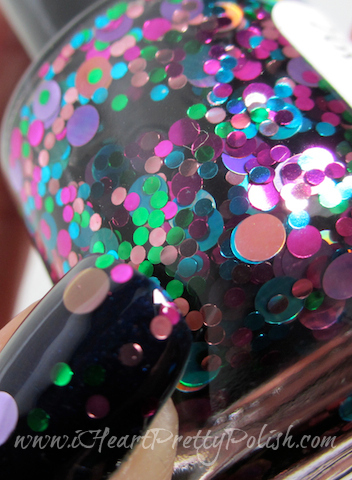 I just love big dot glitter and this one is awesome!